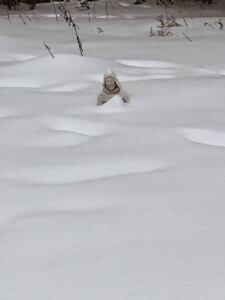 The snow, oh, the snow. One must have a mind of winter, to paraphrase Wallace Stevens (as a certain folk-rock band once did), not to think of the inherent misery of the extreme cold, the extreme inhospitableness, the extreme annoyance of snow. But I am pretty sure Mr. Stevens was not a working parent who had to stay home with stir crazy, and often ill, children who have tasted of the fruits of Good and Evil (AKA ipads and other screens), and who have been given a deathtrap (AKA a mini tramp) by their foolish parents, and who are screaming for blood, (AKA more Harry Potter movies, especially those way above their Screens Guild Suggested Rating). My big insurrection against the winter was the vision and eventual purchase of a treadmill so that I could create a treadmill desk situation. My friend Gayle Huntress came over a few weeks ago and gave me a major organization consultation for my small office space. 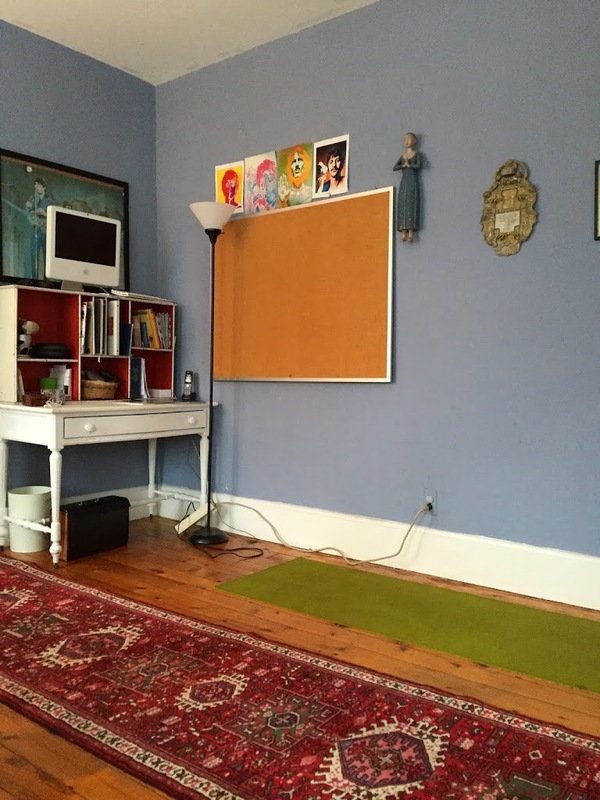 As we poked around my ridiculous amounts of stuff, I mentioned, almost off-hand, that my dream was to set up a treadmill with a desk so I could shuffle my feet and be standing for more of the day. Though I am a regular runner (AKA “plodder”) and visit the gym three times a week for weight training, plus do my daily sun salutation, I am extremely sedentary otherwise. I work from home, so I don’t even have a walk from the parking lot to my office. The most exercise I get outside of my 20 minute a day workout is when I go to the co-op for groceries. Since the weather’s been so horrible, I haven’t even gone out for my run. Instead, I’ve been trotting up and down my stairs for 20 minutes, usually while talking on the phone or texting to people, but also listening to audiobooks on my iphone (I am re-listening to Cheryl Strayed’s wonderful “Tiny Beautiful Things” right now. Highly recommended. )I should also say that for the past 6 years, I have bundled up and run in every kind of weather, doing my 20 minute plod no matter what. This year I began to wonder if this behavior had any correlation to my tendency to get sick and stay stick for six weeks each time I caught a cold. I am happy to report that, with the new stay-inside-and-climb-stairs regime, so far I have had only one cold, and it has only lasted for 10 days. Gayle looked alarmed as I told her all this, mostly out of concern that in my stair-climbing workout I would take a tumble while texting. “Go on Craigslist,” she said. “You can get a great treadmill there.” And together we made an algorithm of the steps I would need to take to get from where I was (a hugely cluttered office with two desks, two desk chairs and a closet full of clothes I never wear) to the office of my dreams, with treadmill and treadmill desk. I searched craigslist for a few weeks. My eye caught on an affordable NordicTrack c900 that seemed the right balance of serious and…well, affordable. I consulted with my sister Abigail, expert on both treadmills and buying stuff in general. My husband warned me that, while he supported the purchase and general concept of a treadmill/desk set up, he would under no circumstances participate in getting the behemoth into our house and up the stairs to my office. Fair enough; his back is as valuable to me as it is to him. So I re-checked the Nordic post and saw that the poster promised “may be able to help with transport.” So I called him. 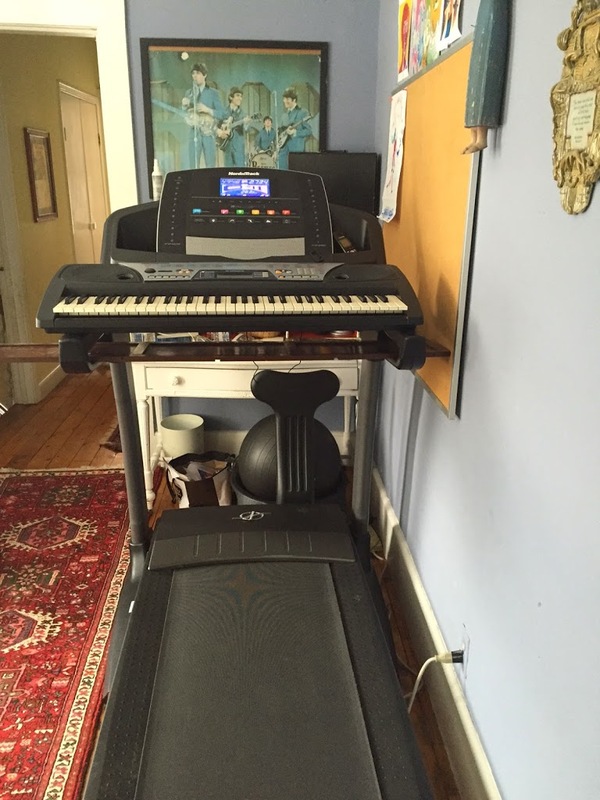 Long story short, the treadmill of my dreams was…right next door. My neighbors have recently moved out of state, and they left all their stuff in their house for this guy I was on the phone with to sell. Top of his list was this gigantic treadmill. All that was left was writing a check and trying to figure out how to get it up the stairs. My poster immediately rescinded his offer to help, citing a hernia, and I called Smooth Movers. 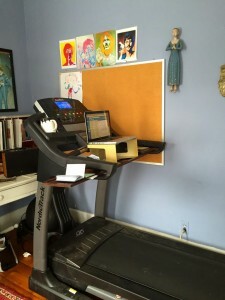 After about three days of moving the treadmill incrementally closer to my office, it’s finally here. And today, I found a loose board in the attic that fits perfectly into the odd armholes. 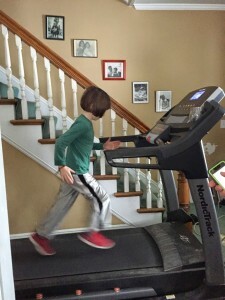 A few words about treadmills, that I should have voiced before I let my kids on it. Treadmills are NOT for kids! This caused a lot of tears and consternation. Both kids had been huge cheerleaders of the treadmill as it rose on our horizon. But on day one, Jay shot backwards right into the door jamb and got whacked in the buttocks. An inch or so to the right and he would have jammed his spine. This is unfortunate. 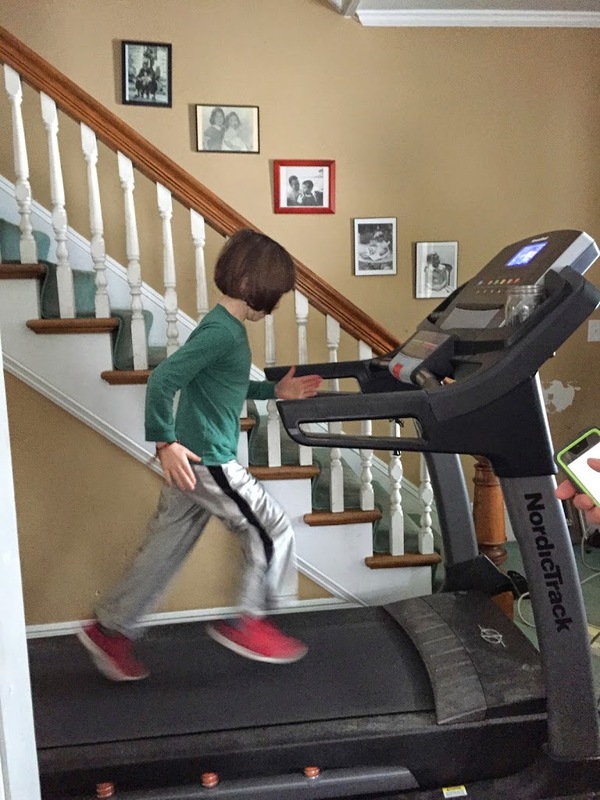 The kids really do need exercise, and I wish there were a safer way to get them moving when it’s so cold out. A few weeks ago, they started a snow shoveling business. Maybe I should hire them again. When they get well. Anyway, Abigail tells me that treadmills’ belts go, and they will need to be repaired. I will keep you posted on my progress. Do you have a treadmill? Do you use yours? Since it took three entire days to get the thing up the stairs, I fully intend on ponying up and making this thing work––before the snow melts. 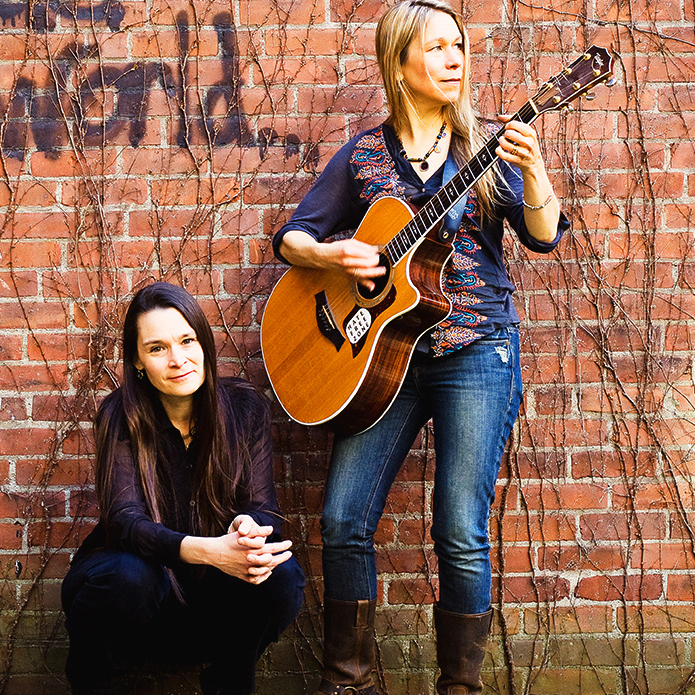 Next up: I am going to buy a keyboard and practice piano as I plod!